This is New Mexico’s traditional cookie. My mother made them for as long as I can remember. She never said where she got the recipe. We always called them “bisenchitos”, but that is probably due to misinterpretation from “biscochitos” by the person who wrote this recipe. I keep trying to change, but I tend to fall back to “bisenchitos” when I am not thinking about it and then have to correct myself. Whatever you want to call them, they are delicious and one of my favorite cookies. Add enough brandy to hold the dough together. If it seems dry, add more brandy. If it crumbles when you roll it out, add more brandy. Roll out about 1/8″ thick to make pinwheels. For pinwheels, cut dough into squares. Cut from each corner halfway to center of square. Lift alternating corners and press gently into the center. This does not need expensive brandy, but avoid flavored varieties such as apricot brandy. I used to make these with lard, but I have adjusted the recipe to use shortening instead. It tends to need more brandy, but we’ll suffer through. We always made them into pinwheels, but you can cut them into simple shapes if you prefer. Roll out 1/4″ thick to cut into shapes. This will make a softer cookie. This is the cookbook that I was given when I was 10 years old and was given permission to cook by myself. Cream shortening, sugar, egg & molasses. Add dry ingredients slowly to sugar mixture until thoroughly combined. Roll teaspoonfuls of dough into balls. Dip in sugar. Place, sugar side up, 3″ apart on greased cookie sheet. Bake for 10-12 minutes or until set, but not hard. Makes 4 dozen 2″ cookies. Combine shortening, sugars, eggs and vanilla. Mix thoroughly. Stir in flour, baking soda and salt. Add water if mixture is dry. Stir in walnuts & chocolate chips. Bake for 8-10 minutes or until lightly browned at the edges and still soft in the center. Makes 4-5 dozen 3 inch cookies. Cook one batch – if the cookies do not spread out, you need to add more water. Add a few teaspoons at a time. We used to use semisweet chocolate chips, but recently we switched to Hershey’s Special Dark chocolate chips which are slightly darker than semisweet. These are the most tender cookies of this type that I have ever tasted. I switched to dark brown sugar because I like the deeper flavor it adds. I prefer creamy peanut butter because they have such a wonderful texture. I also prefer not to roll them in sugar which gives them a crunchy coating. Beat butter until creamy and smooth. Add peanut butter and sugars and beat until light and fluffy, about 2 – 3 minutes. Add to the peanut butter mixture and beat until thoroughly combined. Cover and chill for about an hour, or until firm enough to roll into balls. Preheat oven to 375 and place rack in the center of the oven. Roll the batter into 1″ balls. Place on baking sheet covered with parchment paper or silicone mat, spacing about 2″ apart. Bake for 8 – 10 minutes, or until the cookies are lightly browned. 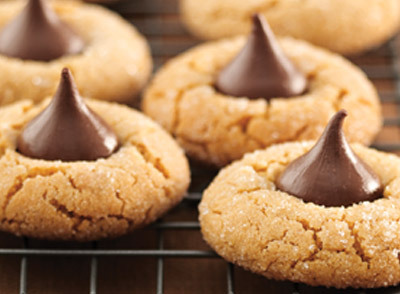 Immediately after removing from the oven, place a Kiss into the center of each cookie, pressing down gently until the cookie just starts to crack. Remove from baking sheet and cool completely on a wire rack. Mix butter, sugars, egg & vanilla. Stir in flour & baking powder. Cover & refrigerate at least 1 hour. Divide dough into 8 pieces. Roll each into a 8″ x 2″ rectangle 1/8″ thick – you can roll out smaller pieces if you like – they are easier to handle. Place on cookie sheet & spoon 1 tsp jam in a line down the center of the dough. The jam will spread in the oven, so don’t make it too wide. Bake at 350 for 10-12 minutes or until light brown; cool slightly. Drizzle with Vanilla Glaze – mix powdered sugar, vanilla and water until smooth & thin enough to drizzle. Add more water if needed. Cut diagonally into 1″ strips (a pizza cutter works well for this). You can substitute another jam for the raspberry – I have used blackberry, marionberry & mixed berry. I think I will try orange marmalade next. Omit the jam and glaze for a delicious sugar cookie.